Tours of Glenbar Gin are available during the ginning season, from mid October through late December or early January. Tour hours are from 8 a.m. until 4 p.m. Monday through Saturday, as long as the gin is in operation. Please call the office at 928-485-9255 to schedule your tour. Glenbar Gin is located at 9845 W Hwy 70, Pima, AZ. 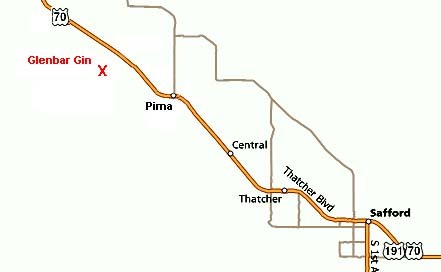 We are approximately 2 miles West of Pima on Hwy 70.